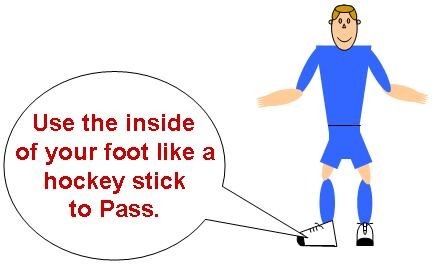 Small sided passing soccer games are crucial in player development and young players will learn how control the ball effortlessly in small spaces, and think faster under pressure. 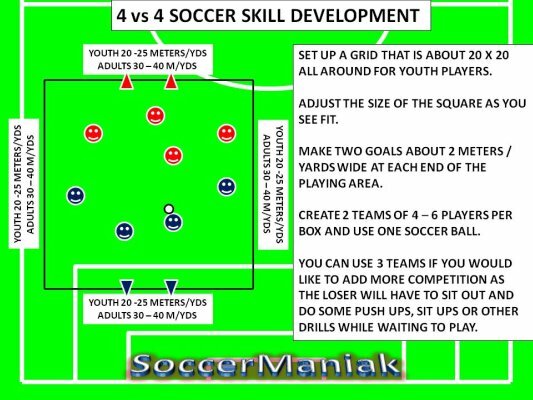 Small sided games are entertaining, and the game itself will be the teacher, with the guidance from the Coach. Many great soccer players have learned their skills by playing soccer when they were children, growing up in a soccer culture where the game is played everywhere, but the actual soccer field. Playing soccer with friends, without restrictions, greatly improves the players overall soccer skills because the game is THE COACH. 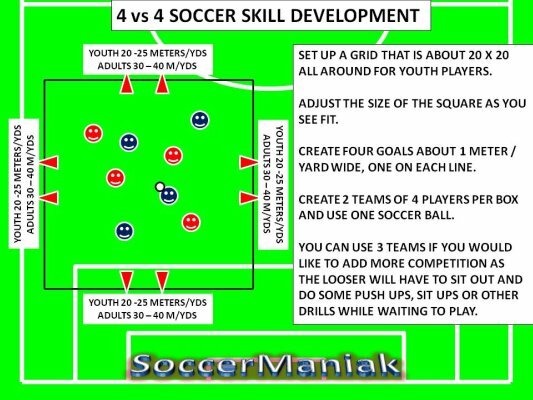 Playing the game every day, for hours at a time, alone or with friends, developing skills on the ball to transform into playing with flair and creativity. "Where I come from, Don Torcuato (a neighborhood in the outskirts of Buenos Aires), we are lucky to have a lot of open spaces and fields. I spent my whole childhood playing football with my friends from dawn to dusk, always in open spaces. Sometimes we'd stop for a bite to eat, and than carry on. I still live there - when I go to Buenos Aires - and I still play football there with those same friends." Riquelme is one of many great players who grew up falling in love with this sport. Passion for the game was born from playing with friends in small sided soccer games, usually in the parking lots, or the streets. YOUTH GRID SIZE 20 - 25 M/YD. ADULT GRID SIZE 30 - 40 M/YD. ADJUST THE GRID SIZE PER NUMBER OF PLAYERS, PLAYING SKILLS, AND AGE. 2 teams will play possession game. To score a goal, each team has to complete a set number of passes (5-20 passes, depending on the skill and age of players). 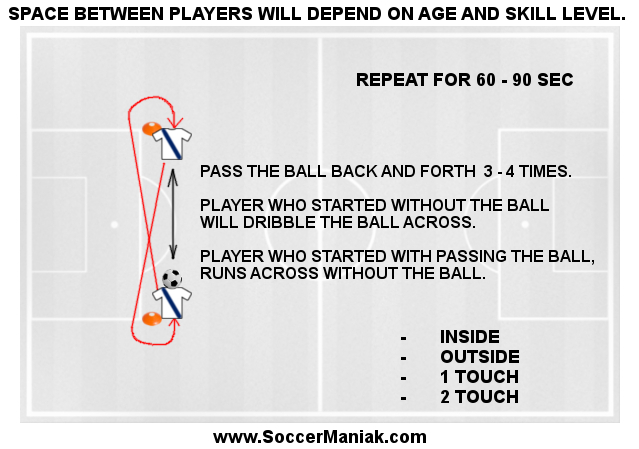 Once the set number of passes has been reached, players can attempt to score in any of the 4 small goals. Defending team will try to win the ball back, and start their own passing game. Team in possession of the ball will need composure, creativity, and firm passing to reach the number of passes set, before attempting to score a goal. Add a neutral player who will always be on the side of the team in possession of the ball. Limit touches on the ball to 1-3 touches, only when the players are comfortable with passing the ball. Encourage give and go passing technique. Players will have to think fast, move around the empty space, pass the ball quickly and accurately, and shoot to score. 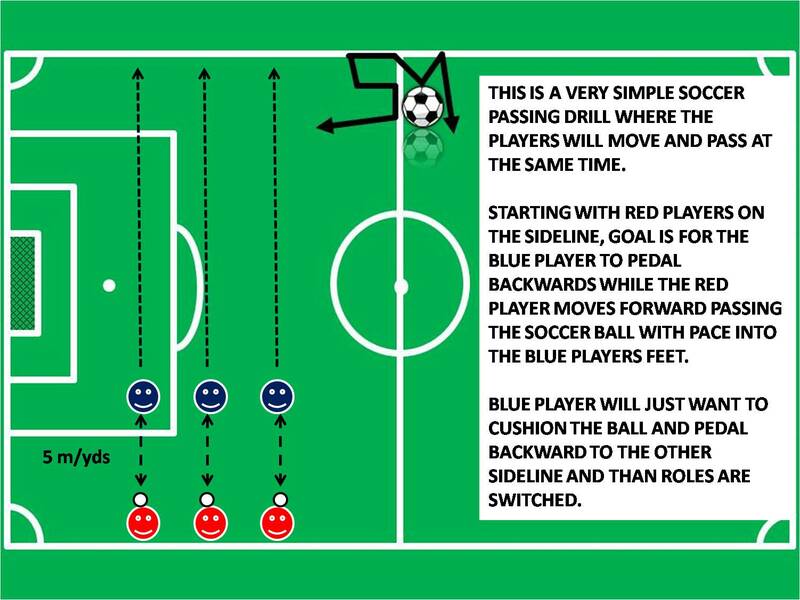 This soccer training exercise allows players to practice many different skills of soccer including: running into empty space, passing, vision, shooting and ball control.